The 2019 1 OZ Silver Australian Kangaroo is one of the hottest bullion coins around. From the Land Down Under, the 1 OZ Silver Australian Kangaroo is a top pick for investors. Upon the debut of the series in 2016, the Kangaroo silver coin exceeded the Perth Mint’s sales expectations by more than double, selling 11 million, versus the projected 5 million. These Australian silver coins really are “bonzer” (or, excellent), as the Australians say, and it’s easy to understand why, this Australian silver bullion coin boasts .9999-fine purity. These rock-solid silver coins are ideal for those who invest in precious metals Individual Retirement Accounts (IRAs). Storing silver coins like 1 OZ Australian Silver Kangaroos in your IRA is shrewd because they can help shelter your investments against the topsy-turvy world markets that can send paper assets plunging in value. They are guaranteed by the Australian government – one of the most politically stable Western governmental systems in the world. 2019 Silver Kangaroos are real, tangible wealth you can hold in your hands. They’re made from .9999-fine silver – that’s four 9s, or 99.99% purity! Australian Kangaroo coins are affordable bullion coins perfect for new and seasoned investors alike. Kangaroo silver coins have a face value of $1 Australian, so it’s real money. Australian Silver Kangaroos are highly liquid so they’re easy to sell. Why Should You Buy 2019 1 OZ Silver Australian Kangaroos From Universal Coin & Bullion? When you buy 2019 Silver Kangaroos from Universal Coin & Bullion, you’re ensuring you receive some of the highest quality silver bullion coins anywhere. Our longtime expert, nationally renowned coin expert Dr. Michael Fuljenz, has more than 40 years of coin grading and authenticating experience. He and his skilled team inspect the coins that come into our possession and hand-select only the finest specimens available for our inventory. Online orders over $99 ship free, and all bullion coins will arrive in safe, secure, discreet packaging. If you have any questions about your order, our customer service to assist in any way they can, and we stand behind all of the bullion coins we sell with our 100% satisfaction guarantee. No wonder we have earned and maintained an A+ rating from the Better Business Bureau, as our products and service are, as the Aussies say, “fair dinkum” – the real deal. Call us today toll-free at 800.822.4653 to order 2019 1 OZ Silver Australian Kangaroo coins before prices hop high. Australian silver bullion Kangaroo coins feature Stuart Devlin’s design of the coin’s namesake kangaroo, a marsupial with strong tails and rear feet that allow the herbivores to jump as far as 30 feet in a single bound and hop up to 30 miles per hour. Kangaroos range in size from less than two feet in length to more than nine feet long from head to tail, and they carry their young in a pouch. On the obverse is a portrait of Queen Elizabeth II, who has served as Australia’s queen since 1952. The effigy of Her Majesty on the 2019 Silver Kangaroo was designed by British sculptor Ian Rank-Broadley and shows a right-facing Queen wearing her crown. Australian Kangaroo silver coins feature a state-of-the-art micro-laser engraving security feature protecting them from counterfeiters. One of those minute engravings, a tiny letter “A” within the first “A” of AUSTRALIAN, can be seen under magnification and helps ensure the authenticity of the coin. Stock up on these beautiful, innovative .9999-fine silver coins before bullion prices increase. 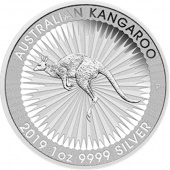 Call 800.822.4653 to order your 2019 1 OZ Silver Australian Kangaroo coins today.